It's been almost 10 years since my last trip to New York. Somehow I never made a layout with pics of one of my favorite little places to shop. The Ink Pad is one of those stores I could spend hours looking in. It's a paper crafter's paradise. I used the May kit from the Paper Bakery which includes the cute DIY Shop ephemera pack from Crate Paper. Could the map and corner store piece be any more perfect! I also used one of the photo overlays as an embellishment. I think they look cool layered in among everything, not just as a photo overlay. Beautiful page! Those are great elements from the DIY collection! LOVE this layout!! So many great layers! This layout totally made me WOW! Love how you used the photo overlay! And is that a gold sequin on the camera wood veneer? So cute! A new favorite Mary Ann!! 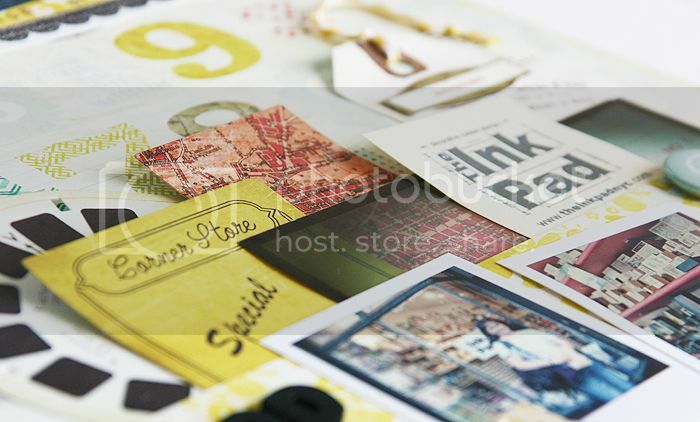 Love the number paper for your background and the use of all of the DIY Shop bits! !